Here is part 2 of the three-part series “Why Are My Tires So Loud?” This article focuses on uncommon or abnormal reasons why your tires may be making more noise than usual. Uneven treadwear can cause noise and vibration. There are a number of reasons why you may have uneven treadwear. The following list may help you figure out if you are experiencing uneven treadwear, and what is causing it. Under Inflation: Tires with insufficient air pressure will wear more on the outside edges than in the middle. Squealing is a sign of under-inflated tires. Over Inflation: Tires with too much air will wear faster in the middle than on the sides. It’s best to check tire pressure regularly to avoid issues. Camber Wear: If one of the shoulders wears more than the other, your car is experiencing camber wear. Camber wear indicates wheel misalignment. Wheel misalignment may be caused by a damaged ball joint, or another suspension issue. Feathering: If one edge of the rib rounds while the other becomes sharper, it means the tire is feathering. Feathering is caused by a wheel alignment issue, likely a wrong toe-in setting, worn out bushings, or faulty front suspension. Cupping: Cupping is identified by areas across the tread, where rubber appears to be scooped. Cupping may be caused by bent or worn suspension or tire imbalance. If you notice any of these patterns, it is important to fix the underlying issue. You will need to rotate the tires after fixing the problem. 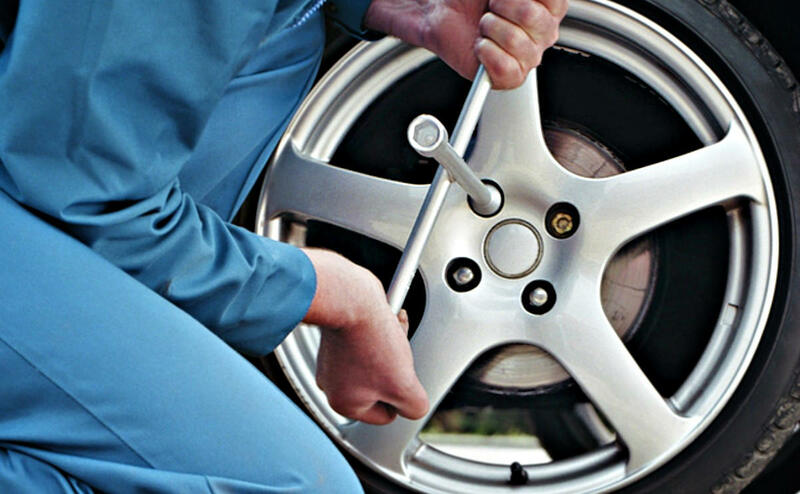 If the damage is too severe, you will need to change out the damaged tire. Tire rotation: Omitting tire rotation from your regular maintenance will lessen the life span of your tires and make them sound louder. The tires on your car each experience different loads, and therefore do not all wear the same. Changing the location of the tires on your vehicle evens out the wear, so that one tire doesn’t wear down to the point of failing prematurely. You should rotate your tires every 8000 to 10000 kms. Tire balancing: Tire balancing refers to the process of strategically adding weights to areas of the wheel to make sure that the mass is even all the way around. an imbalanced tire will make itself worse if it is not corrected and can lead to failure. Tires should be balanced whenever a vibration at high speed is noticed or every few years and can be done by most auto shops. Wheel alignment: Misaligned wheels will wear unevenly, leading to increased noise and performance issues. A wheel alignment problem will also cause the suspension to wear unevenly, which is a serious safety concern. Wheel alignment refers to three main angles: camber, the angle for the wheel being perpendicular to the ground; caster, the relation of the steering axis to the ground; and toe, the angle of the wheels to each other (which should be parallel). Its best to just ask your mechanic to take a look at the alignment while having your tires rotated. Neglecting any of these procedures will cause the tires to wear unevenly, leading to noise and vibration. There are parts of your car besides the tires themselves that can contribute to tire noise. These are the 5 most common non-tire issues that can turn up the volume on your commute. Wheel Bearings: Hear a noise when changing lanes? Chances are it’s your wheel bearings. Damaged bearings will louden as speed increases and they are put under strain, such as while changing lanes. CV Joints: These components provide axle flexibility while the wheel and suspension move. Damage to the CV joints will likely be accompanied by popping or clicking. Struts: Malfunctioning struts will reduce the ability of your vehicle to absorb shock and bumps. The extra pressure will be transmitted to the tires, and eventually, result in excessive noise. Hubcap Lug Nuts: The hubcap will shake if a lug nut is loose. This shaking will be accompanied by a rattling noise. Drive Belt: The drive belt is what connects the alternator, AC system, and power steering to the crankshaft. The noise made by the drive belt is often confused for tire noise. Stay tuned for Part 3 of the series, where we discuss solutions to tire noise. If you think your vehicle may be suffering from any of the issues listed above, give us a call or stop by and we will be happy to figure out what’s going on.